With inwise integrative marketing system you can create free Pop-up banner to your site, without any investment in development or design. The installation takes 2-3 minutes, just adding short section of a code into your website pages. Implementing a registration Pop up form on your site ensures that you will automatically expand your mailing list in your inwise account and to increase the number of leads and sales. In order to create Pop-up banner, we should login into inwise system, on the top of page, click on “Pages and Forms” on the top black bar, then on the right page under “Common actions”, click on “Create Signup Form”. After clicking on the selected template, we’ll pass into the forms editor, where we can edit and design the form. You can learn more about the content editor in the “Create and design landing pages” guide and about forms editor in the “Create and Edit Form” guide. The work on the forms editor is the same as on the campaigns editor and landing pages editor. After we finish to design the signup form, we should click on “Next” button to choose our Thank you page. 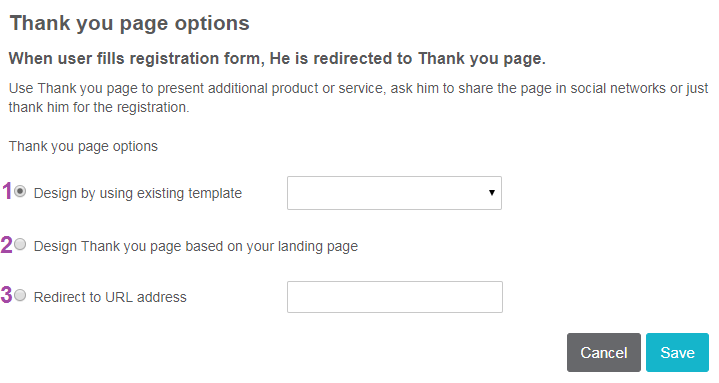 Thank you page, is a page that the recipient get directed after filling the sign up form details registration. The page can contain Thank you message for registration, and also can contain details about the continuation. For example: “Thank you for registering. Discount of 10% sent to your mail in this moment”. Design by using existing template – you can choose one of our design thank you templates pages from drop down list field. Design Thank you page based on your landing page – the system known to take the form design, as you designed it, and let you make some changes to your Thank you page. Redirect to URL address – after filling all details, the recipient will redirect to URL address like website home page, sales page or discounts page. Important: you can change the Thank you page content, design and links, any time by clicking on the gearwheel icon on the right side of the page. To finish, click on “Next” in the bottom right side of the screen. Add signup form name. This is the name that will appear in the list of landing pages and forms which you can identify the form in the landing pages and forms section. This name is internal only. Priority: In case we have several pop-up forms to embed in the web, we can choose priority for each form. 5 is the default priority and defined as the lower. You can choose the appearance type of the pop-up (stable or blinking), background color and opacity around the pop-up, also you can choose between several options for closing the pop-up and positioning in the page after shown. You can choose the trigger to show the pop-up – after page load, when customer stop his activity in the page, after customer scroll half page and after customer scroll full page. You can choose only one option. Pages visited: you can choose several rules which according to, the pop-up will appear to the user only if he visited specific pages in the web. You need to enter URL address according to our request and choose after how much time we want the pop-up perform this test (after X minutes or few hours we’ll choose). Visit duration: few seconds after the user stay in the page, the pop-up will appear. In order to expand the mailing list and increase the quantity of leads, we will perform automatic import of all contacts that update the pop-up in the web, directly to the mailing list in your account in inwise system. Step 1: import fields mapping enable the system to identify the details you imported, and connect it to the correct field in the system. In case the system isn’t identify the fields automatically, you can define manually the field name which the column will map to. Choosing the option “Update my existing contacts (Slows the import process)”, will update the details of existing contacts in the account. Step 2: choose group from the group list that exist in the account or create a new one. After finish the import setting, you can publish the form, by clicking on “Publish” button in the bottom of the screen.